I've lived in New Mexico for nearly seven years. I find much that is endearing about the state but one of my favorite things is New Mexico's official state cookie, the biscochito. While I was familiar with red and green chile, ristras, and sopapillas, I'd never heard of the cookies before moving here. As soon as I tasted biscochitos I became an instant fan. These gems are melt-in-your-mouth sugar cookies studded with anise seeds and dipped in cinnamon sugar while they are still hot. It's a spectacular flavor combination. Source: my sister-in-law, Melanie Peterson, who grew up in Albuquerque. Cream the lard, eggs, sugar, milk, and vanilla together until smooth. Sift together the flour, baking powder, salt, and anise. Add to the wet mixture and stir well. This will become a rather stiff dough. At this point you can refrigerate the dough or you can roll and cut immediately. On a very well floured surface, roll the dough to about 1/4 inch thick and cut with a cookie cutter. Bake on an un-greased cookie sheet at 350F for about 10 minutes or until the cookies are just barely starting to turn light brown on the edges. Remove from the cookie sheet immediately, and while they are still warm, dip cookies in a cinnamon-sugar mixture. I find this is most easily done in a shallow dish, such as a pie plate. Place on rack to cool. Note: You may be somewhat dismayed at the amount of lard this recipe calls for but it is the lard that gives these cookies their pleasing texture. I'd rather eat lard than shortening especially if it is leaf lard. (I'll admit I worry that shelf stable hydrogenated lards have the same problems as shortening.) I have rendered my own lard from pork fat when I can't find leaf lard. You can find all sorts of instructions for rendering online, but here is a good one. About altitudes: I've only cooked this at high altitude so I know it works. If you bake this at a lower altitude than 4,000 feet, let me know how they turn out. I know we could tweak it, but sometimes cookies don't need to be changed much. Growing up, my dad was the one who made the guacamole. His recipe is simple, but perfect. I've never tried a more complicated recipe that I like better. 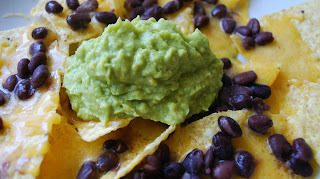 Dad's guacamole features in a family favorite on Christmas Eve, which we will post shortly. As with most guacamole, the quality of your avocados is key. And after years of using avocados and making guacamole myself, I still make mistakes and open avocados before they're ready or after they've gone south. But it's happening more infrequently. You want the skin to be black, and the fruit to give a little when you push on it. But too much give means the avocado is past its prime! The trick to the correct texture is to whip the guacamole with a fork for a long time. I made the batch above, and my dad, the guacamole master, made the batch below. You can see that his has a smoother, creamier texture. Mash the avocado with a fork. Add lemon juice, garlic, and salt. Mix until somewhat smooth. Whip with a fork by hand for a minute or two for a smoother and creamier texture. I'm pretty excited today. I baked my first homemade croissants. They are pretty darn good, but I'm not bragging if I give credit to the original poster, David Lebovitz (my favorite ice cream recipe author). All I did was follow a recipe which took attention 3-4 times, but really wasn't very time consuming. It was a bit of a rolling pin work out, though. Since I'm enthused about this, I'm just going to include the link and hope you'll go there. I plan to post the recipe sometime, but not today. One of the great things about this recipe is that it has some whole wheat flour which helps me feel less guilty about tearing into a croissant. For the recipe, please click on the link above. Lebovitz gives great directions. However, one thing I noticed was that he instructs you to leave the point on the top of the croissant but none of his photos of his croissants show that he did that himself. I found that in at least one case the point slipped off towards the back. Next time I will try it with the point underneath, or nearly. These aren't quite as beautiful as Lebovitz's but not bad for a first try. Making broth from the Thanksgiving turkey carcass makes all the holiday work even more worthwhile. What a fragrance! This is my favorite way to use the broth I make a couple of days after the big feast. I don't feel like I'm eating leftovers when I eat this soup. Melt the butter in a large Dutch oven over medium-high heat. Cook onions, celery, and turkey carcass until lightly browned. Add wine (or water) and chicken broth and simmer over medium-low heat for at least an hour. Strain broth, discarding solids. Wipe out the Dutch oven and toast the rice over medium heat until it begins to pop, 5-7 minutes. (Last time I made this, the rice didn't pop and almost scorched. At that point, I figured it was ready so I went ahead without the popping.) Stir in the turkey broth, carrots, thyme, and baking soda and bring to a boil. Reduce the heat to low and simmer, covered, until rice is tender, about an hour. Whisk the flour and cream in a small bowl until smooth. Slowly whisk the mixture into the soup. Add the turkey (and vinegar if you didn't use wine) and simmer until the soup is slightly thickened, about 10 minutes. Season with salt and pepper. Serve. I think making broth from a turkey carcass will yield more than what this recipe yields (about 2 quarts of broth). When I made this last week, I had cooked the broth the day before, so I substituted 2 quarts plus a cup or two. It wasn't completely accurate, I imagine, but it worked. About 34 years ago we learned about roasting a turkey on a Weber grill and have done it every year since. Colette doesn't even know how to cook a turkey in an oven. We love the taste, the smell, the moist texture of the meat and we enjoy having the oven free to cook everything else that accompanies a Thanksgiving meal. The turkey and the stuffing have become my jobs, spreading the work out, which goes a long way towards making the last Thursday in November a happy day. We can't remember the source, but its likely an old Betty Crocker cookbook. Melt butter and add the onion and celery, cooking over medium low heat until they are translucent. Add the seasonings and stir for 30 seconds. Add the bread and toss. Stuff the turkey cavities lightly. Secure with kitchen twine and or skewers. Place turkey on the grill and cook. Stuffing is one of the Thanksgiving essentials in our family so we have always made more than will fit in a turkey. We cook it on top of the grill during the last hour of turkey roasting and mix it with the stuffing that comes out of the turkey. We find the mixture of wet (from inside the turkey) and dry (from the grill top) best. Heat the stuffing that was in the turkey in the microwave to make sure the stuffing has reached its "safe" temperature of at least 165F and then mix with the "dry" stuffing. Keep it in a 200 degree oven until serving time. For excess stuffing, make rectangular foil pans so you can fit stuffing around the turkey on top of the grill. Place these on during the last hour or so that the turkey is roasting. For years, I've torn the bread and left it out to dry a couple of days before Thanksgiving. However, Cook's Illustrated scientists indicate that stale bread and oven-dried bread aren't quite the same and the end result is better if you dry your bread pieces in the oven, rather than allowing them to go stale on the counter. Apparently stale bread will end up soggy compared to the oven-dried bread. To dry the bread, heat oven to 325F and place bread (about a pound of bread) in a rimmed baking sheet. Bake for 45-55 minutes stirring occasionally and turning the tray once. Cook until the pieces are golden brown and dry. See this link for more information. I live in a high desert that is becoming more desert-like all the time. Unlike many places, it is noteworthy when we get a snowstorm in December. This storm is beautiful but cold enough for me to want to eat comfort foods. I tried this oatmeal this morning. I'm certain it can take other tasty additions like chocolate chips, chocolate nibs, and/or some chopped peanuts. Combine the oatmeal, water, and salt in a medium saucepan. Bring to a boil, stirring, over medium-high heat, then reduce the heat to medium and cook, stirring occasionally, for 5 minutes, until thickened and creamy. Add the peanut butter, banana, milk and butter; mix gently to combine. Cook for 1 minute. Serve while hot. The flavor improves overnight so double it and eat it again the next day. Stir in a little milk to loosen it up while warming the oatmeal. This fruit salad comes from a Spackman family cookbook my mom compiled about 15 years ago. It includes favorite recipes from my Grandma Spackman, her 14 children (of which my dad is number 3), and their spouses. Specifically, this recipe is from my Uncle David and Aunt Kim, who called it Thanksgiving Cranberry Salad. I agree with my Uncle David that it's good anytime, so I changed the name. This salad is a tasty accompaniment to pie for breakfast on the day after Thanksgiving. Finely chop cranberries, in a food processor if possible (it's much easier). Add sugar and let stand 8 hrs or overnight. Place in colander and drain for 1 hour. Prep the remaining ingredients, stir everything together, chill, and serve. Here's a treat for Halloween. The zucchini here makes the cake very moist, and the espresso powder enhances the chocolate flavor. I'm not a huge fan of frosting, so I love the chocolate glaze, too. As I looked up the source to post, I found a note about mixing the chocolate chips with half-and-half as another topping option, which sounds decadent. Now for the trick. My boys' birthdays are 5 days apart, on either side of Halloween. I made this cake for the October birthday, but guess what. Mom was the only one to eat a piece! Next year I'm putting candles in ice cream. A note about altitude: I have made both the original recipe and a cake with altitude adjustments. I can't remember a difference, but I also haven't tried them side by side. Preheat the oven to 325°F. Lightly grease a 9x13 pan. In a large mixing bowl, beat together the butter, oil, sugar, vanilla, baking soda, baking powder, and salt until smooth. Beat in the eggs. Stir in the sour cream, buttermilk, or yogurt alternately with the flour. Add the cocoa and espresso powder, mixing until smooth. Fold in the zucchini and 1/2 c chocolate chips. Spoon the batter into the prepared pan. Bake the cake for 30 to 35 minutes, until the top springs back lightly when touched, and it seems set. To ice the cake: Slide the cake out of the oven, sprinkle it evenly with the 1 c chocolate chips, and return it to the oven for 5 minutes, or until a cake tester inserted in the center comes out clean. Remove the cake from the oven, and use a cake spatula or rubber spatula to spread the chocolate chips into a smooth glaze. Cool on a rack. I travel with recipes. Not so much when I'm staying in a hotel, or visiting my brothers in Europe, but when I know I'll have time to cook and people to cook for. Our recent trip to Albuquerque was a perfect opportunity. I brought an entire cookbook with me, along with probably 10 recipes printed out. We ate these lovely sweet potato fries for lunch one day, with BLTs. The dip is tangy and cuts the sweetness of the fries nicely. The cookbook I brought was Dinner: A Love Story by Jenny Rosenstrach, who also authored this recipe (although it's not in the book). My friend Susie gave me the book for Christmas last year, knowing my penchant for not only recipes, but writing about food. Jenny describes the development of family dinner in her home over the course of her life as she wed, had children, modified her career, and as those children grew. Jenny's approach is practical and funny, and she includes tips for entertaining as well as mid-week meals. In addition to the book, she maintains a blog at http://www.dinneralovestory.com/. Preheat oven to 450F. Toss sweet potatoes and oil on a foil-lined large rimmed baking sheet; season with salt and pepper. Roast, turning once, until golden brown and crisp, 25-30 minutes. Meanwhile, whisk mayonnaise, lime zest, and juice in a small bowl. Season fries with salt, top with cilantro, and serve with lime mayo for dipping. My brother John served his LDS mission in Denmark. Later, when my family visited his family he delighted us by making ableskivers. We loved dipping the spheres in a variety of sweets. I wanted to learn how to make them since our visits were rare; at this time we were living overseas. Ableskivers are fairly well known to American diners nowadays but in the late 80s it was difficult to find an ableskiver pan. We finally found one at Smith and Edwards, the big overstock store just off I-15 north of Ogden, Utah. I hauled the cast iron pan to Bahrain in my luggage. I soon found that cooking these for a family of hungry eaters would be more efficient if I had a second pan. I procured another. (I have to give credit where credit is due and admit that John gave me one pan but I can't remember if it was the first or the second. I do remember the Smith and Edwards shopping experience, however.) You should be able to find a pan (or two) in a number of places. But Google will spell it aebleskiver in an online search. For years these have been a Saturday morning favorite breakfast or Sunday dinner when I have family or friends eating with me. During their recent visit, Adam and Gabe got to eat ableskivers for the first time. Yield: lots and lots--when I made these for my grandsons I kept careful count but have since lost the record. I believe it likely the yield was around 70. This recipe could be easily halved. Place the aebleskiver pan over medium heat and preheat the pan. Depending on your stove you will have to watch and change to keep the heat at a level that doesn't burn the outside of the aebleskivers before the insides are cooked. A scorched but gooey aebleskiver is, to say the least, undesirable. Whip the egg whites to a stiff meringue. Set aside. In a large bowl mix the egg yolks and stir in the sugar. Measure flour in a bowl and stir in the baking powder and cardamom, if using. Add the flour and milk to the egg yolk mixture, alternating 3 times, stirring well with each addition. The batter should be like a thick pancake batter. Gently fold the egg whites into the batter. You're ready to cook. You may oil the pan with cooking spray but I like to have a bowl of melted butter and a pastry brush nearby to lube the pan between batches. This is the best way to get butter on these spheres. Once the pan is oiled or buttered, use an ice cream disher to pour the batter into the pan up to the level of the opening. Of course, if you don't have a disher, just use a quarter cup measure. Let the aebleskivers cook until browned on the bottom then turn them over using a chopstick. The tops will be covered with bubbles, like pancakes just before turning. I push the stick right down the middle to the bottom of the batter and pull it up to flip it over. There will be runny batter held by the cooked portion of the sphere; just let it flow into the bottom and set the cooked part on top. You may have to re-seat the aebleskiver a bit with your fingers or the back of a spoon. Let them continue to cook. Knowing when these are done becomes easier with experience. Use a toothpick as a tester and keep cooking until there is no liquid clinging to it. The toothpick can also be used to remove the aebleskivers from the pan when they are done. I like to cook several batches of aebleskivers before calling a big group to the table and keep them warm 200 degree oven. Allow diners to choose from several options for dipping: cinnamon sugar, powdered sugar, demerara sugar, jam, honey, or Nutella. Each person should place several dippers and some aebleskivers on a plate and dig in. If there are leftovers, they can be frozen for a month or so. They'll start to get a bit tough if they are in the freezer longer. Once when a grandson was visiting we by mistake found that overfilling the pan's mold (by about a spoonfull) will produce what he called "Saturn aebleskivers" and at least one batch of "Saturns" is always requested whenever I make aebleskivers for my grandsons. Yes, I know it's fall now and most people don't have garden tomatoes anymore. However, I came home from my trip to New Mexico to find that a bunch of green tomatoes I picked before the freeze had turned red while sitting in my basement. 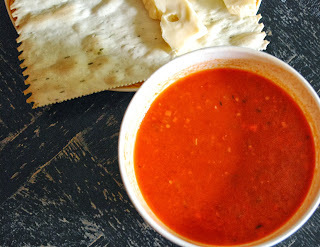 So, I seized the opportunity to make fresh tomato soup. Obviously these pictures are two different batches of this recipe. In the top picture, the soup is blended enough to make it soup, but it was still a little chunky. The vegetables were unpleasantly crunchy, so for the second batch, I cooked the vegetables for quite a long time and then blended for maybe 20 seconds. This soup was pleasingly smooth and lighter in color. Paired with grilled cheese sandwiches, this is a fabulous meal. Prepare the tomatoes. Place the tomatoes in boiling water for about a minute, then plunge into a bowl of ice water. Core, peel, and chop the tomatoes. You should have about 4 c pulp. Depending on the size of your tomatoes, this can take a while. About halfway through preparing your tomatoes, and depending on how soft you want your veggies, you may want to start the vegetables. Heat the oil in a large saucepan. Add the onion, carrot, and celery and cook over medium heat until softened. (The original recipe says about 5 minutes, but I probably did 15-20 minutes.) Add the herb and tomatoes and cook until the tomatoes lose their shape, about 10 minutes. Season with salt and pepper to taste. Add the stock and simmer until the flavors have blended, about 5 minutes. Puree the soup in a blender until quite smooth. Adjust the seasonings and serve immediately. Basil and croutons sound like a nice garnish, although I've never done it. Also, the original recipe reports that the soup works well chilled. Betsy and I spent 10 days together just before and during the Albuquerque Balloon Fiesta which ended Sunday. Michael was able to join us for a few days, too (limited leave days, you know). The little boys were with Mommy at Grandma and Grandpa's house so I feel pretty spoiled to have had them all with us. I made this grown-up version of the familiar treat while my visitors were with me. Betsy and I both feel a little shamefaced that we share an affection for Rice Krispie Treats, at least the homemade kind. 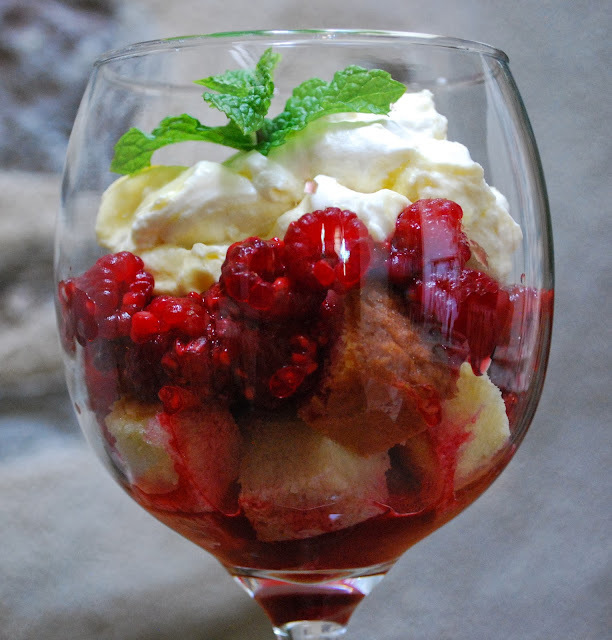 But our fondness for the confection grew recently when I found this recipe. The original instructions don't call for drizzling melted chocolate over them but I couldn't see that it would hurt anything. It didn't! In a large pot, melt the stick of butter over medium-low heat. It will foam, then turn clear golden, start to turn brown and smell nutty. Stir frequently and watch closely so it doesn't get darker than the color of a pecan shell. As soon as the butter has browned, remove it from the burner. Stir in the salt and then the marshmallows. The residual heat should melt the marshmallows but if you need to, return to very low heat for a short time. The marshmallows should be smooth but retain their opaque whiteness. Remove the marshmallow mixture from the stove and stir in the cereal, stirring it until coated. Spread into the prepared pan and press it firmly into the corners. Use a piece of parchment or wax paper, sprayed with oil to keep it from sticking. If your hands are tough, you can butter your fingers and press the mixture down without resorting to the paper. Apparently a silicone spatula will work fairly well, too. Let cool. Melt chocolate in microwave, 10-20 seconds at a time, depending on your microwave's power. I used a spoon to drizzle the chocolate, but it wasn't very efficient. Just yesterday I read that you can put warm chocolate into a ziplock bag, clip a tiny bit of a corner, and squeeze a thin drizzle out. I haven't tried this; I'll report back when I do. You may also mold this in a 9X13 cake pan, but the treats will be thinner, of course. I'm sure you could double it, too. The first time I tasted Lemon Curd was when I lived Bahrain and a British neighbor gave me some she had made. I've been a fan ever since, although I often purchased it after that first tasting. Since finding this recipe, I eat it only when I can make it. One must become comfortable with tempering eggs for a custard because that is what curd is; although it is flavored with fruit juice rather than cream or milk. Lemon Curd can be used as a spread on bread, scones, or crumpets (if you can find them). It makes a lovely topping for cake, ice cream, or cheesecake. Immediately remove the pan from heat and stir in the cold butter until incorporated; stir in cream, vanilla, and salt, then pour cur through a fine-mesh strainer into a small nonreactive container. Cover the surface of the curd directly with plastic wrap; refrigerate until needed. After the curd has cooled you may remove the plastic and cover with the lid of the container. This recipe can be easily doubled, which is what I usually do. At higher altitudes water boils at a lower temperature than at sea level. In candy making one lowers the target temperature to correspond with the temperature difference; for example, at my altitude, I subtract 10 degrees. I've thought it might be the same in this recipe, but I have found that at 160 F, the curd is not sufficiently thickened. However, it gets a bit too thick if I let it cook to 170 F. Cooking to 165 F results in the best texture. Those of you at a similar elevation (4900 feet) may want to do the same. It's best, though, to use the photos at Cook's Illustrated as a guide. It's hard for me to believe I didn't discover polenta until 10 years ago. I never saw it on a menu at an Italian restaurant and certainly never heard it mentioned. I adore polenta and am glad to have come across it, even later in my life. I think some cooks have avoided it because old recipes instructed cooks to stir for 45 minutes or so. That isn't necessary, although it should be cooked slowly at a very low temperature to let the flavors develop (except for the microwave method, also included below). Apparently it is a traditional peasant food; versatile, rather inexpensive, and fairly quick to prepare. Bring 4 cups water to a boil. Gradually stir in the polenta in a slow steady stream, then add the salt. Lower the heat to medium if you are cooking over gas or to low if you are cooking on an electric stove. Stir until the polenta has absorbed enough water to make an even mass, more or less. Lower the heat even more, to the lowest setting. At this point you can leave it alone, stirring just now and then to make certain it isn't sticking. It should be cooked for at least 30 minutes to have the best texture and flavor. The longer it cooks after that, the better. (I find it usually takes me 30-45 minutes to prepare a topping so if I start the polenta first, everything is ready at the same time.) Once done, add 1 T salt and 1/2 c grated parmesan cheese. Other cheeses, especially left over odds and ends may be used. According to Madison, fontina and mozzarella are good as are Gorgonzola or other blue cheeses. Taste to check the salt; stir in more, if needed. At this point, spoon polenta on your plate and top with a meat sauce, braised greens, sauteed mushrooms or serve with chicken or pork. There are plenty of suggestions on the internet. Also see the note accompanying Italian Braised Green Beans. In a 2-quart Pyrex measuring cup, covered with plastic wrap, microwave cornmeal, water, and salt at 100% power for 6 minutes. Uncover and stir thoroughly, then continue to microwave at 100% power until polenta is creamy and fully cooked, 5 to 6 minutes longer. Stir in pepper. Stir in 1-2 T butter and 1/2-3/4 c parmesan cheese. Check for seasonings and serve. When polenta cools, it becomes rather solid. You may use it as left overs in the solid form. Cut into pieces and heat in olive oil (this has a tendency to pop, a little like popcorn, but it is tasty). Although it is rather early for the middle Rio Grande Valley, we've experienced a couple of light freezes this past weekend. I'm disappointed because we should get a couple more weeks of growing temperatures, at least. However, I won't be sorry to see the last of the mosquitoes (for this season). I feel sad these beans are among the last I will pick this year. I've posted two green bean recipes back to back. I'm launching a one-woman assault on green bean casserole for Thanksgiving, which is just around the corner. This recipe features something that is fresher, simpler, and tastier than that traditional recipe. Another of its advantages for a holiday dish is it should be served at room temperature and can be prepared ahead of time. Bring several quarts of water to a boil in large saucepan. Add the beans and about 1 teas salt.Cook until crisp-tender, about 5 minutes. Drain, shake as much water off as you can, and then spread out over a clean towel so they dry quickly. Let the beans cool for several minutes. While the beans are cooling, mix the yogurt, garlic, dill, cayenne, and salt to taste in a small bowl (I don't add extra because I salt the water). Place the beans in a large serving bowl. Spoon the yogurt sauce over the beans, toss, taste for seasoning, and serve immediately. If you can't find fresh dill in November or December, coarsely crush some dill seed in a mortar and pestle and mix it with the yogurt mixture. Start with half a teaspoon; if you need more, add it. You may cook the beans and make the yogurt mixture ahead (as much as a day) and refrigerate them until 20-30 minutes before serving. At that point stir the yogurt mixture into the beans and serve. Doesn't that sound nice for a day with lots of cooking? Before the growing season is over I must share one more method for using those older, tougher green beans that have hidden from the harvester until they are too big to miss. Those who don't garden may not run into these beans, although sometimes supermarket produce departments offer beans that look considerably past their prime. This recipe may be useful to us all. Let me point out that the beans will resemble canned beans in color but will be superior in flavor and texture. Don't be afraid to try something that isn't "crisp-tender." My well-used copy of the book, Vegetables Everyday by Jack Bishop, is the source for this recipe, correctly titled "Braised Green Beans with Tomatoes, Olives, Capers, and Basil." I must admit I feel annoyed with recipe titles that list every ingredient. So I changed the title; rather too broadly, I fear. Bishop himself muses that it should be called "Green Beans Puttanesca." Heat the oil in a sauce pan or a saute pan. Add the garlic and saute for 1 minute. Add the beans and stir them well with the oil and garlic. Add the tomatoes, olives, and capers and bring the liquid to a boil. Add some salt (approximately 1/2 teas) and pepper; if you use fresh tomatoes you'll have to add more salt. Reduce the heat to medium-low, cover, and simmer until the beans are quite tender but not mushy. Stir a few times while the beans simmer. For a side dish, remove the cover from the pan and cook to evaporate the remaining tomato liquid. Stir in the basil and check seasonings; serve immediately. The other night, I used this as a topping for polenta and was pleased with the results. However, I advise doubling the tomatoes for use as a sauce and skip the evaporating step. If you want to make this more puttanesca-like, add a pinch of red pepper flakes for more heat. I'm in mourning because it's the last week or so of fresh peaches in Utah. I still have a quarter bushel of Hales to enjoy, but then we're back to canned peaches. This pie recipe is supposed to solve the common problem of soupy peach pies. My first attempt was still a little soupy; I'm not sure if it's altitude or if I had too much juice in the mashed peach mixture. But the flavor is amazing. It tastes so strongly of peaches--just peaches--that I preferred the pie on its own, without ice cream. I also enjoyed that the filling was not too sweet. The pie dough is easy to work with, and the "mock" lattice top is a nice substitute for weaving. Sadly, though, it didn't produce any leftover dough for pie crust cookies! This will definitely be on the list of peach desserts for next year's peach season. Process flour, sugar, and salt in food processor until combined, about 5 seconds. Scatter shortening over top and process until mixture resembles coarse cornmeal, about 10 seconds. Scatter butter over top and pulse until mixture resembles coarse crumbs, about 10 pulses. Transfer to bowl. Sprinkle 5 tablespoons ice water over flour mixture. With rubber spatula, use folding motion to evenly combine water and flour mixture. Sprinkle 5 tablespoons ice water over mixture and continue using folding motion to combine until small portion of dough holds together when squeezed in palm of your hand, adding up to 2 tablespoons remaining ice water if necessary. (Dough should feel quite moist.) Turn out dough onto clean, dry counter and gently press together into cohesive ball. Divide dough into 2 even pieces and flatten each into 4-inch disk. Wrap disks tightly in plastic wrap and refrigerate for 1 hour or up to 2 days. Toss peaches, ½ cup sugar, lemon zest and juice, and salt in medium bowl. Let stand at room temperature for at least 30 minutes or up to 1 hour. Combine pectin, cinnamon, nutmeg, and 2 tablespoons sugar in small bowl and set aside. Remove dough from refrigerator. Before rolling out dough, let it sit on counter to soften slightly, about 10 minutes. Roll 1 disk of dough into 12-inch circle on lightly floured counter. Transfer to parchment paper–lined baking sheet. With pizza wheel, fluted pastry wheel, or paring knife, cut round into ten 1¼-inch-wide strips. Freeze strips on sheet until firm, about 30 minutes. Adjust oven rack to lowest position and heat oven to 425 degrees. Roll other disk of dough into 12-inch circle on lightly floured counter. Loosely roll dough around rolling pin and gently unroll it onto 9-inch pie plate, letting excess dough hang over edge. Ease dough into plate by gently lifting edge of dough with your hand while pressing into plate bottom with your other hand. Leave any dough that overhangs plate in place. Wrap dough-lined pie plate loosely in plastic wrap and refrigerate until dough is firm, about 30 minutes. Meanwhile, transfer 1 cup peach mixture (try to get only peaches, not any juice) to small bowl and mash with fork until coarse paste forms. Drain remaining peach mixture through colander set in large bowl. Transfer peach juice to liquid measuring cup (you should have about ½ cup liquid; if liquid measures more than ½ cup, discard remainder). Return peach pieces to bowl and toss with cornstarch. Transfer peach juice to 12-inch skillet, add pectin mixture, and whisk until combined. Cook over medium heat, stirring occasionally, until slightly thickened and pectin is dissolved (liquid should become less cloudy), 3 to 5 minutes. Remove skillet from heat, add peach pieces and peach paste, and toss to combine. Transfer peach mixture to dough-lined pie plate. 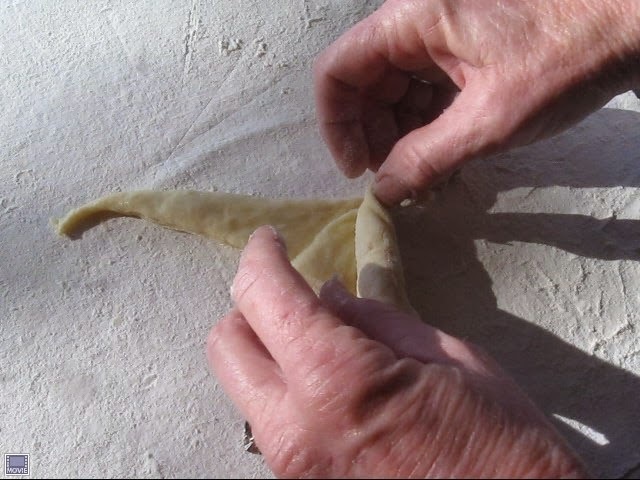 Remove dough strips from freezer; if too stiff to be workable, let stand at room temperature until malleable and softened slightly but still very cold. Lay 2 longest strips across center of pie perpendicular to each other. Using 4 shortest strips, lay 2 strips across pie parallel to 1 center strip and 2 strips parallel to other center strip, near edges of pie; you should have 6 strips in place. Using remaining 4 strips, lay each one across pie parallel and equidistant from center and edge strips. If dough becomes too soft to work with, refrigerate pie and dough strips until dough firms up. Trim overhang to 1/2 inch beyond lip of pie plate. Press edges of bottom crust and lattice strips together and fold under. Folded edge should be flush with edge of pie plate. Crimp dough evenly around edge of pie using your fingers. Using spray bottle, evenly mist lattice with water and sprinkle with remaining 1 tablespoon sugar. Place pie on rimmed baking sheet and bake until crust is set and begins to brown, about 25 minutes. Rotate pie and reduce oven temperature to 375 degrees; continue to bake until crust is deep golden brown and filling is bubbly at center, 30 to 40 minutes longer. Let cool on wire rack for 3 hours before serving.